All images adapted from presentation slides by Steve Dewey, retired, Utah State University. Herbicides are formulated to make them easier to handle, mix and apply. Understanding the type of formulation of the product you purchase will help you use it more effectively. This article provides a basic overview of the different types of herbicide formulations and their advantages and disadvantages in terms of effectiveness, safety and ease of use. Click the button above for a chance to test your knowledge of herbicide formulations. A Tordon® 22K herbicide formulation contains the active ingredient (picloram), and inert ingredients (adjuvants and water). Adapted from presentation slides by Steve Dewey, retired, Utah State University. Herbicide formulations contain active ingredients (the component of the herbicide formulation responsible for being phytotoxic to the weed) and inert ingredients. Inert ingredients include anything other than the active ingredient and can usually be divided into two categories including solvents and adjuvants. Common solvents include substances such as water, petroleum distillates and clay. A single active ingredient often is sold in several different kinds of formulations. Understanding the characteristics, advantages, and disadvantages of different types of herbicide formulations as they relate to the following list will help applicators choose the formulation that will be the best for each use. Herbicides are formulated to be applied as: 1) Solutions, 2) emulsions, 3) dry formulation suspensions, and 4) granules. A primary factor in deciding how an herbicide active ingredient will be formulated is based on its solubility in various carriers. Ideally, active ingredients would be water soluble for easy mixing and application. However, not all herbicide active ingredients are soluble in water. Active ingredients usually fit into one of three solubility classes including water soluble, oil soluble, and non-soluble. An active ingredient may actually fit into more than one category. A true solution is when one chemical is fully dissolved into another and the resulting liquid is clear (particles of added material completely disassociate into individual molecules). Particles in solution cannot be seen, or separated by physical or mechanical methods. Examples of water-soluble herbicides include clopyralid and aminopyralid (Transline® and Milestone® specialty herbicides) formulated as soluble concentrates (SC). Both liquid and dry soluble powder (SP) formulations can form true solutions. 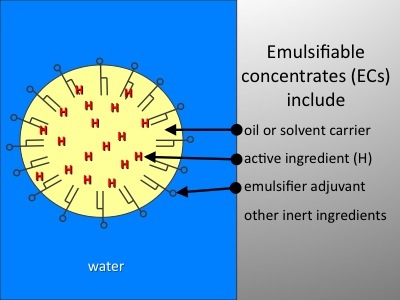 Emulsifiers are like chemical bridges, stitches, or zippers between droplets of oil and the body of water. They are linear molecules with a hydrophilic (water-loving) head and a lipophilic (oil-loving) tail. When mixed with water and oil they congregate at the interface between the two liquids “stitching” them together by orienting themselves with tails in the oil droplets and heads in the water. 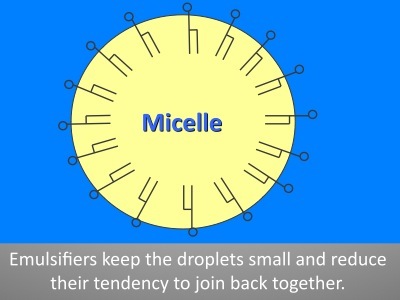 This keeps the droplets small and reduces their tendency to join back together. The resulting liquid has a milky appearance because light is refracted off the many round micelle surfaces rather than being able to pass straight through the liquid body. Some active ingredients can be formulated as either a soluble soluble liquid (SL) or an emulsifiable concentrate (EC). An example is triclopyr. Vastlan® specialty herbicide is soluble in water, while Garlon® 4 Ultra specialty herbicide is an ester formulated as an EC. Some active ingredients are not readily soluble in either water or oil-like solvents, or for some other reason cannot be formulated as an EC or SC. These herbicides are often formulated as a dry material, such as a wettable powder (WP), dry flowable (DF), water dispersible granule (WDG), or water dispersible powder (WDP). Occasionally they are formulated as a flowable liquid (FL), which is a thick slurry of water plus wettable powder. Herbicides formulated dry but sprayed out in water (WP, WDG, WDP, DF), have the active ingredient mixed with and adhered to the surface of tiny, finely ground, dry inert particles such as clay, talc, or chalk dust. 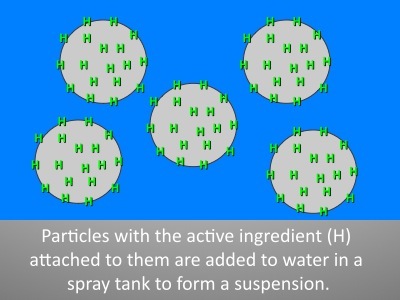 Dust particles with the active ingredient molecules attached to them are added to water in a spray tank to form a suspension. Particles in suspensions are larger than those found in solutions. Components of a suspension can be evenly distributed by mechanical means, such as agitation in a spray tank, but without agitation the components will settle out. Wettable powders (WP) consist of finely divided, solid particles dispersed in a liquid. The mixture consists of active ingredients adhered to clay, a dispersant, and a wetting agent. 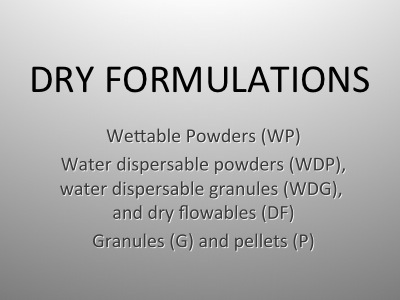 Wettable powders are not desirable formulations with manufacturers and users because of problems with dust and mixing. Water dispersible powders (WDP), water dispersible granules (WDG), or dry flowables (DF) are formulations developed to replace wettable powders (WP). These products are formulated as small granules (without dust) with dry dispersing agent added. 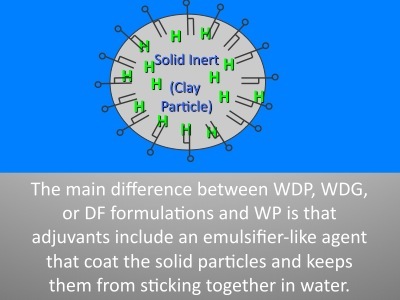 The main difference between these formulations and WP is that adjuvants include an emulsifier-like agent that coats the solid particles and keeps them from sticking together in water. 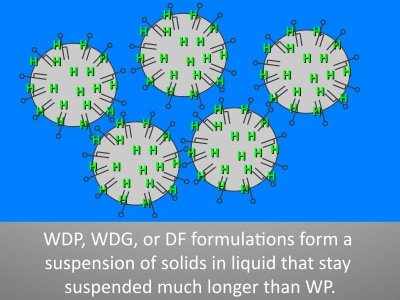 These formulations form a suspension of solids in liquid that stay suspended much longer than WP. An example of a water dispersible granule is Opensight® specialty herbicide, which combines the active ingredients aminopyralid and metsulfuron-methyl. Granules (G) and Pellets (P) are applied as ready-to-use dry formulations for application without a liquid carrier. With granules, the herbicide is usually absorbed into the granule or coats the outside of the particle or both. 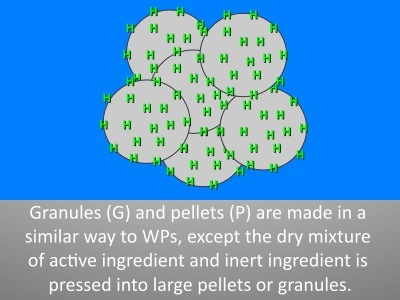 Pellets are larger than granules, and the active ingredient is usually combined with inert materials to form a slurry which is extruded under pressure. The resulting particle is cut at a desired length for the pellet. Pellets and granules should not be applied on steep slopes, on frozen soil, or in close proximity to root systems of sensitive non-target plants. An example of a pellet herbicide formulation is Spike® 20P (tebuthiuron). Each formulation has advantages and disadvantages in terms of safety, effectiveness, and ease of use. A letter designation for formulation is usually on the label. The major herbicide formulation categories include: Soluble concentrates (SC), soluble powders (SP), emulsifiable concentrates (EC), wettable powders (WP), water dispersible powders (WDP), water dispersible granules (WDG), and granules (G). Herbicides are formulated to make them easier to handle, mix, and apply. Formulations include active ingredients and inert ingredients (solvents and adjuvants). A single active ingredient often is sold in several different kinds of formulations. Herbicides are formulated to be applied as 1) solutions, 2) emulsions, 3) dry formulation suspensions, and 4) granules and pellets. Understanding the type of formulation of the product you purchase will help you use it more effectively. Milestone and Vastlan specialty herbicides are not registered for sale or use in all states. Contact your state pesticide regulatory agency to determine if a product is registered for sale or use in your state. State restrictions on the sale and use of Garlon 4 Ultra, Transline and Opensight specialty herbicides apply. Consult the label before purchase or use for full details. Tordon 22K is a federally Restricted Use Pesticide. Milestone and Opensight specialty herbicides: When treating areas in and around roadside or utility rights-of-way that are or will be grazed, hayed or planted to forage, important label precautions apply regarding harvesting hay from treated sites, using manure from animals grazing on treated areas or rotating the treated area to sensitive crops. See the product label for details.